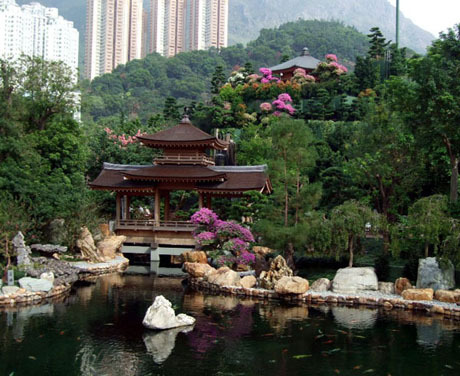 Although the location of the garden is in urban Kowloon this is a truly beautiful, colourful and scenic place with a tranquil and serene atmosphere. Whilst there are plenty of high-rise buildings in the vicinity of the garden the distant backdrop to the north is of the scenic mountain ranges of Lion Rock, Tate’s Cairn, Temple Hill and Kowloon Peak. Noise barriers shield the gardens from the sound of traffic outside the garden and mounds have been placed around the whole garden with extensive planting of trees to filter exhaust and dust from the surrounding area. 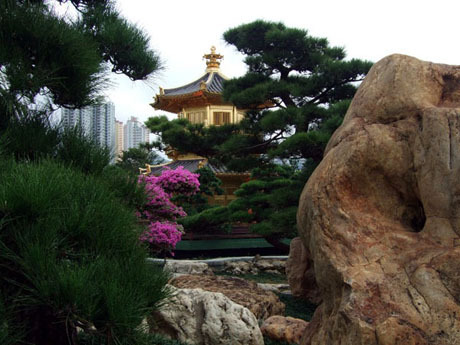 The garden is characterised by the four main elements of Tang-style gardens with artificial hillocks and ornamental rocks, water features, timber structures and old trees. The Chinese tradition of “earth enclosing rocks” is adopted for the formation of hillocks in the garden. The rocks used are mainly from Sanjiang County. Other rocks include Caitao rocks, Heshan rocks, Laibin rocks, Qinghua rocks, petrified trees and hexagonal rocks. 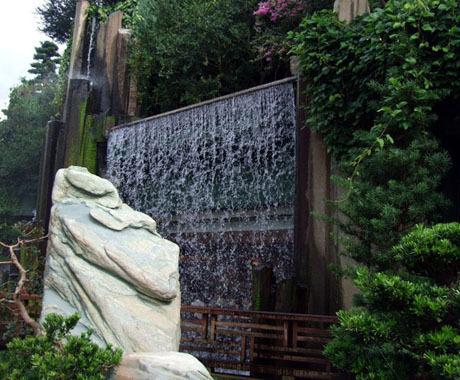 Water features such as the Spring, Lotus Pond, Blue Pond, Pine Brook, Moon Wash, Silver Strand and Waterfall were created to resemble their natural states. Distinctive timber structures include pavilions, terraces, tower, storeyed pavilion, waterside pavilion, bridges and the Black Lintel Gate are built in Tang architectural style along the quiet, winding paths. Precious old trees throughout the garden include Buddhist Pine, Japanese Black Pine, Cypress, Pagoda, Silver-back Artocarpus and Common Crape Myrte. 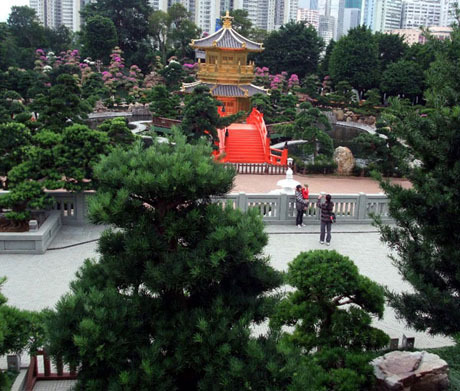 The garden is designed with the intention that visitors follow a one-way route and the landscaping is based on the on traditional Chinese techniques such as “borrowing scenes”, “concealing scenes”, “sheltering scenes” and “penetrating scenes” to create space. On entering the gardens visitors pass through the Black Lintel Gate before reaching the Chinese Timber Architecture Gallery which contains wooden models of traditional Chinese timber structures and illustrates construction methods such as those used at Chi Lin Nunnery. Following the one-way route visitors stroll along the Banyan Grove and Pine Path South before reaching the Lotus Pond. In the Lotus Pond is the stunning gold Perfection Pavilion connected by two red painted timber Zi Wu Bridges (not accessible to visitors). To the left of the pond is Spring Hill, one of the garden’s hillocks with trees and waterfall and surrounded by rocks. 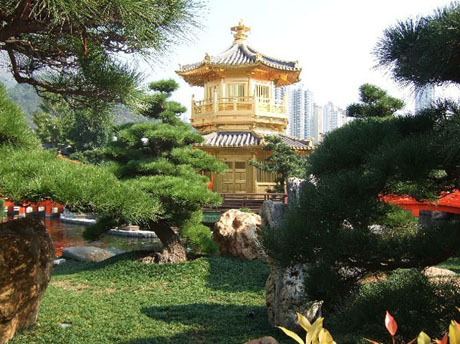 Just past the Lotus Pond on the south side of the garden is Xiang Hai Xuan (meaning a house embracing a sea of fragrance) flanked on one side by Fragrance Hill with its sweet-scented trees including osmanthus, lily and orange-jasmine. 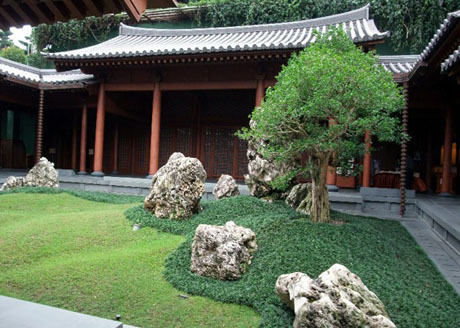 Xuan is fronted by a central courtyard in Tang Style with Ying Shan roofs made of grey tiles and surrounded by a quadrangle with green lawn, ancient trees and rocks. The inner room contains a multi-purpose hall which is hired out for art exhibitions, musical performances and seminars etc. A short distance beyond Xiang Hai Xuan is the Blue Pond stocked with Koi and with rocks and water features. The Lunar Reflection Terrace and Pagoda Tree Pavilion on the pond’s edge allow visitors to the opportunity to relax and enjoy the pond and reflections of buildings on the opposite side. From the pond visitors can cross the Pavilion Bridge to another water feature The Mill and Silver Strand waterfall. Adjacent to Silver Strand in the northeastern corner of the garden lies Long Men Mou, a three-storey building with plants its balconies and roof and housing the Chi Lin Vegetarian Restaurant. The main path continues between Song Cha Chi on the left and Tang Gallery on the right. Song Cha Xie, built on the northern side of Blue Pond is a Tang-style timber quadrangle with Chinese teahouse. The central courtyard is occasionally used for staging mini-concerts and dramas. The Tang Gallery is a single-storey building with with snack shop and souvenir shop. 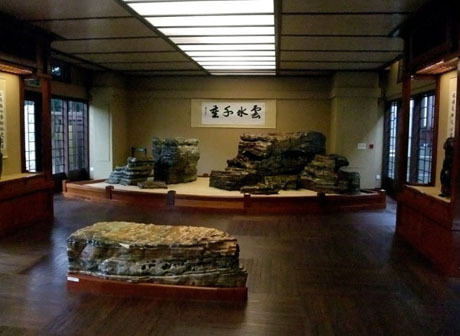 Beyond the Tang Gallery is the Rockery with indoor displays of rocks from the Hongshui River. Visitors then pass the Light of Enlightenment statue and fountain and the Nan Lian Rocks located at the foot of the bridge linking the garden with Chi Lin Nunnery on the opposite side of Fung Tak Road. Located in the Tang Gallery the souvenir shop offers a range of special souvenirs including pottery and porcelain, rocks from the Hongshui River, Chinese traditional handicrafts, stationery and healthy vegetarian foods including 60-year old preserved citrus peels and preserved mature ginger from Guangdong. 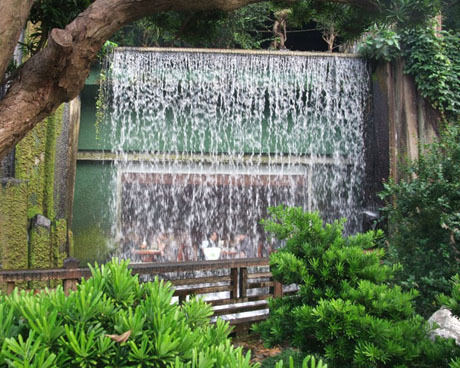 Located at Long Men Lou in the northeast corner of the garden the restaurant sits behind a waterfall and has a panoramic window allow diners can look through the cascading water into the gardens. 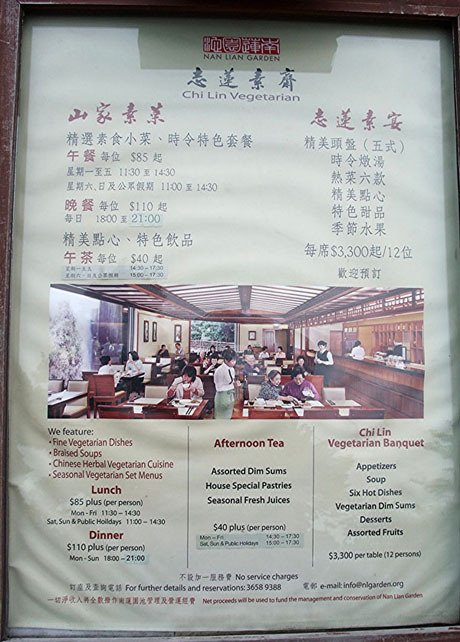 The restaurant is managed by Chi Lin Nunnery and serves high quality vegetarian food with a variety of gourmet meals, notably the “Chi Lin Vegetarian Dinner” and set meals for two and four people etc. Various Chinese dishes are available including starters and stewed broths, main dishes and hotpots as well as congees, rice vermicelli, noodles and rice plus a variety of beverages. The restaurant serves lunch, dinner and also Afternoon Tea Sets. There is no service charge. Located in the Tang Gallery in the north of the garden the shop serves vegetarian sandwiches and beverages including hot and cold drinks and fresh fruit juice. Set menus are available on holidays. Located on in the north of the garden on the side of Blue Pool, Song Cha Xie serves high quality Wuyi Chan Ya and Aged Pu’er Teas. Wuyi Chan Ya is produced with tea leaves of a species that grow naturally in the cracks of stones stones on Mount Wuyi, a World Nature and Cultural Heritage site. The leaves are free of pesticides and fertilisers and are processed in accordance with ancient tradition under the supervision of Chi Lin Nunnery. The traditional method of making Wuyi Yan Cha has almost disappeared in modern times and the nunnery has invited two experienced tea masters, familiar with the traditional technique, to take charge of tea processing which involves the leaves being stored for several years before they become mature enough for brewing. Types of teas served include Da Hong Pao, Tie Luo Han, Bai Ji Guan, Shui Jin Gui etc. Each table is equipped with a complete set of utensils for tea-making including water taps and vent, electric hot plate and pot for boiling water, as well as hand-made pure white porcelain tea set. Slippers are provided for visitors to wear inside the teahouse and visitors can either brew their own pot of tea or call on waiters to brew tea or demonstrate the art of tea making. The teahouse also serves dim sum and sells gift packages of teas and white porcelain tea sets imported from Jiangxi. GARDEN RULES – the garden is a serene and peaceful place and visitors are requested to abide by certain measures to allow others to enjoy the tranquil nature of the gardens. Amongst these measures visitors are requested not to dress improperly, as this will not will be in harmony with the garden scenery, use of tripods for photography is not allowed, visitors are requested to refrain from group photography as this may cause nuisance to others trying to enjoy the scenery and may block narrow paths, eating and drinking (except water) is not allowed in the garden except in designated areas of the food outlets in the garden and visitors are requested not to walk on the grass. Saturdays, Sundays and Public Holidays - Lunch 11-30am to 3pm, Afternoon Tea 3pm to 5-30pm, Dinner 6pm to 9pm. GETTING THERE – MTR Kwun Tong Line to Diamond Hill. Entrance to garden is about 5 minutes walk from exit C2 (Plaza Hollywood) at 60 Fung Tak Road (under flyover). There are tourist direction signs from the station exit. Bus routes 11,74X,75X,82X,82P,84M,85C,85M,91,91M,92,286M to Diamond Hill Public Transport Interchange (under Diamond Hill MTR Station). Bus routes 3B,10,11C,74X,91,92 stop near garden entrance on Fung Tak Road. 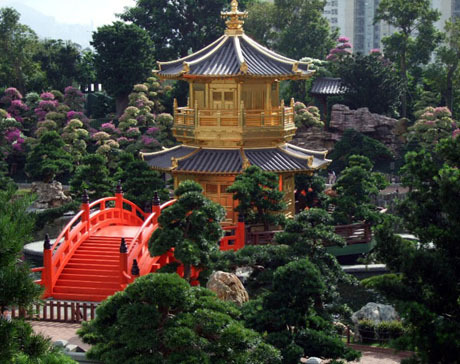 The garden can also be accessed directly from adjacent Chi Lin Nunnery by pedestrian footbridge over Fung Tak Road.